Tucked in the core of the small town of Powell in North Central Wyoming is Plaza Diane, a LEED Gold Community Arts Center reclaimed from a modernist 1950s service station. The project is conceived as a home for visual arts and performance to be exhibited in the culturally rich community, but the community went much further by incorporating a host of design elements to significantly reduce the building's impact. We recently took a tour of the project and learned how a small group's shared vision manifested in this fantastic gathering place. Driving through town, the bright and airy Plaza Diane jumps out amongst the older buildings. The original plaza is named after a prominent civic leader Diane E. Bonner who was instrumental in developing a thriving downtown. Alas, the concrete stage and patio on the corner of Main Street was not too inviting, further depressed by the abandoned ’50s era gas station. When the station was being looked at to be torn down for a new bank, community members created a plan to save the old station and revive the plaza as an arts venue and community space. The refreshed public plaza brings in rain gardens, trellises, pervious pavers and a stage canopy. In the summer, there is the “Splash Pad” water fountain for kids to play in, and Coolaroo shade sails and color and relief from the sun. The rounded trellises framing the project reflect the classic rounded entrance to the modernist service station. The building was upgraded with energy-saving features, but retains almost all of its original character — down to the preservation of the look of the original garage doors. Inside, the floor plans works remarkably well as a gallery space. Upper north facing windows add nice natural lighting throughout, and tall ceilings accommodate the decidedly commercial look of the exposed ductwork. The building is feed one-thirds of its electricity by an onsite solar electric array. Claims of the project to be an “off-site net zero energy” building by buying RECs is an assertion that’s hard to defend for the building and hopefully a term that drops out of favor by architects. Another lesson learned was the use of expensive gimbal ring incandescent lighting for the gallery space where next generation LEDs would have done just as well at a dramatically lower energy cost. 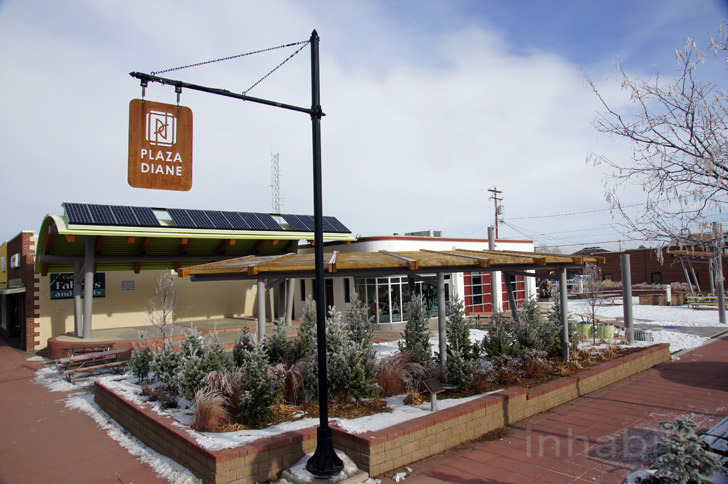 What cannot be contested is the powerful way Plaza Diane invigorates Powell’s community, giving residents and visitors a inviting and enriching experience of Wyoming hospitality. Driving through town, the bright and airy Plaza Diane jumps out amongst the the other old buildings. The original plaza is named after the prominent civic leader Diane E. Bonner who was instrumental in developing a thriving downtown. Alas, the concrete stage and patio on the corner of Main Street was not too inviting, further depressed by the abandoned 1950s era gas station. When the building was being looked at to be torn down for a new bank, community members created a plan to save the old station and revive the Plaza as an arts venue and community space. The refreshed public plaza brings in rain gardens, trellises, pervious pavers, and a stage canopy. In the summer, there is the “Splash Pad” water fountain for kids to play in and Coolaroo shade sails add color and relief from the sun. The rounded trellises framing the project reflect the classic rounded entrance to the modernist service station. The building was upgraded with energy saving features but retains almost all of it original character -- down to the preservation of the look of the original garage doors. Driving through town, the bright and airy Plaza Diane jumps out amongst the older buildings. The original plaza is named after a prominent civic leader Diane E. Bonner who was instrumental in developing a thriving downtown. Alas, the concrete stage and patio on the corner of Main Street was not too inviting, further depressed by the abandoned '50s era gas station. When the station was being looked at to be torn down for a new bank, community members created a plan to save the old station and revive the plaza as an arts venue and community space. The refreshed public plaza brings in rain gardens, trellises, pervious pavers and a stage canopy. In the summer, there is the “Splash Pad” water fountain for kids to play in, and Coolaroo shade sails and color and relief from the sun. Inside the floor plans works remarkably well as a gallery space. Upper north facing windows add nice natural lighting throughout, and tall ceiling accommodate the decidedly commercial look of the exposed ductwork. The building is fed two-thirds of its electricity by an onsite solar electric array. Claims of the project to be an “off-site net zero energy” building by buying RECs is an assertion that is hard to defend for the building industry and hopefully falls out of favor. 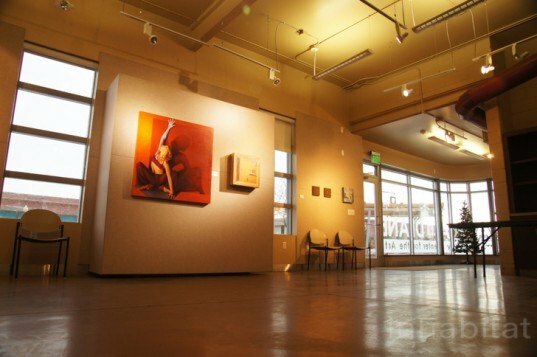 Another lesson learned was the use of expensive gimbal ring incandescent lighting for the gallery space where next generation LEDs would have done just as well at a dramatically lower energy cost.